"Music," Ludwig van Beethoven said, "is the mediator between the spiritual and the sensual life." Transcending dogma, creed, culture and even language, music has the power to elevate the soul as well as the mind. It's the source of a type of faith as often discovered outside traditional organized religion as within it. While spirituality and religion are not mutually exclusive, in the parlance of our time, music is "spiritual but not religious." It's a paradox understood and embodied by the late classical cellist Felix Wurman, creator of the enigmatic Church of Beethoven, founded in an abandoned gas station on old Route 66 in Albuquerque, N.M.
Wurman first convened the Church of Beethoven, a nondenominational Sunday morning meeting where music is the message, in 2008. It now has two more "congregations" in Durham, N.C., and more recently in Oak Park, Ill., a suburb of Chicago. Oak Park, my hometown for more than a decade until I relocated to Southern California, is a progressive, quirky and artistic community where the writer Ernest Hemingway and the iconoclastic architect Frank Lloyd Wright once resided -- and where Wurman was raised. and poetry before sticking around for brunch. "It's a spiritual thing that doesn't necessarily have a specific religious thing, but it definitely touches the same chords in people," said Jean Lotus, one of the conveners of the Oak Park Church of Beethoven. "I felt like this is the kind of thing you can do that can bring people together. It can make people have a sort of spiritual, uplifting experience. And the poetry actually does put ideas into words." Calling the gathering a "church" is not intended to be disrespectful to traditional faith communities, some of whom bristled when the music-as-worship services began in New Mexico and North Carolina. "We're not declaring war on religion or anything like that," said Lotus, who is Catholic and regularly attends Mass with her family of seven. "Not all people go to church. I do. ... On Church of Beethoven days we go to an early Mass and then go to the Church of Beethoven." Wurman's sister, Candida Wurman Yoshikai, convener of the Durham Church of Beethoven, said her brother was not traditionally religious. The idea behind the church was to have a house of worship where "music was a principal element and not just an afterthought," she said. us at a really deeply profound level." Just as silence forms the central element of worship in a Quaker meeting, in the Church of Beethoven the music is the worship, the homily and the anchor of the community of believers, if you will. Wurman's concept for the Church of Beethoven, where the music itself is the preacher, reminds me of a favorite spiritual quote, often attributed to St. Francis of Assisi: "Preach the gospel; when necessary, use words." The son of pianist and composer Hans Wurman, an Austrian Jew who escaped the Holocaust and immigrated to Chicago, Felix Wurman received his first cello when he was 7 years old and began performing publicly at age 12. "When Felix was dying, he told me, 'I was definitely handed something,"' Wurman Yoshikai said. "He was very brilliant. We're all in music, but he was really gifted." With his chamber group, Domus, Wurman sought to bring classical music to folks who weren't familiar with it or didn't have the means or the will to purchase tickets for the symphony or opera. It was in the spirit of those early Domus performances that Wurman founded the Church of Beethoven. Musically speaking, the church is nondenominational. It may be named for Beethoven but the music offered isn't limited to the German composer. 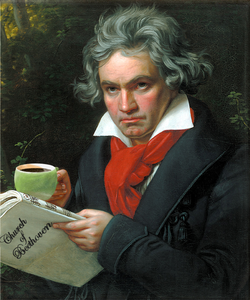 Beethoven, who was raised Catholic and composed many religious works during his lifetime, including the great "Mass in C Major" and "Missa Solemnis," seemed to find his greatest spiritual connection in the music itself. As her brother's legacy, Wurman Yoshikai hopes the Church of Beethoven will spread, creating more musical congregations across the nation and the world where those of no faith (or any faith) can find sacred community and spiritual connection. "Go on; don't only practice your art, but force your way into its secrets," Beethoven said. "Art deserves that, for it and knowledge can raise men to the Divine." The Church of Beethoven classical music experiment began in 2007 in an abandoned New Mexico gas station off Historic U.S. Route 66. Inside the tiny, less-than-orchestral space, top-notch musicians from the Albuquerque Symphony would perform every Sunday. "I've never been so close to classical music," said one regular attendee, "I was just about getting poked in the eye with a bow." That intimacy was just what founder Felix Wurman wanted. 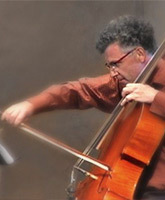 Wurman, a classical cellist who grew up in Oak Park, started Church of Beethoven in Albuquerque as a way to deliver classical music on a much more personal scale: "To create a new concept in classical music ... to get rid of the 'fourth wall' between the players and the audience and create a more familial feel ... a community," is how he described it. Wurman was inspired after performing as a hired cellist at a traditional church service, he said. "How about a church that has music as its principal element rather than as an afterthought?" In Albuquerque, Wurman and his cohorts soon created a word-of-mouth Sunday morning sensation: a "church" with no preaching or affiliation to religion — organized or disorganized. But there was plenty of spirituality there. Within two years, Church of Beethoven outgrew its original filling station venue (now a theater space) and moved to a converted warehouse space with vaulted ceilings and chandeliers, seating 150. The music isn't limited to Beethoven. Performers — booked six months in advance — perform both the adventurous and recognizable. Sadly, Wurman was diagnosed with bladder cancer and died at age 51 in December 2009. But the "church" carries on in Albuquerque with a large staff of volunteers. Now, with assistance of the Wurman family, The Church of Beethoven concept comes to Oak Park this summer at Italian restaurant Trattoria 225 — presenting three Sunday morning performances, beginning this Sunday, July 17. The concerts will feature a short one-hour classical mini-concert, with an interlude for spoken word and two minutes of silence. Performing the music of Bach will be local youth virtuoso Scott Daniel — a violinist with the Chicago Youth Symphony Orchestra (Scott also plays bluegrass fiddle with the Oak Park Farmers Market band and in the rock band "Lej"). A Bach cello suite will be performed by Swiss cellist Katalin von Walterskirchen. Spoken word poetry by Oak Park writers Sheila Black Haennicke, Leisa Martheler Hoover and Tim Leeming is also on the "menu." As Albuquerque musicians discovered, Sunday mornings are perfect for classical music. Church of Beethoven concert-goers can enjoy a discounted brunch at Trattoria 225 and hopes to attract visitors to the Harrison Arts District on Sundays. Performances are meant to be short, family-friendly and non-intimidating. Leave your pearls at home. The Church of Beethoven concept is a "gateway drug" to the world of live classical music — an attempt to build an audience from which all local classical music organizations can benefit. Wurman's concept is simple and has really struck a chord in "Albuquirky." Felix Wurman's sister, Candida Yoshikai, founded a branch in Raleigh-Durham N.C., performed in Nelson Music Hall at North Carolina State University. "Chamber music was played in Europe in chambers," says Yoshikai, herself a violin teacher. "They would gather together in someone's parlour and play. ... Everyone has an affinity to music and the experience of the music of the masters can be so fulfilling to both heart and mind." Church of Beethoven founder Felix Wurman (1958-2009) grew up in Oak Park, the son of European immigrants Hans and Brenda Wurman, who played "so much music in Oak Park," says Candida Wurman Yoshikai, Felix's sister. The Wurmans were a musical family — Hans' father performed with Brahms in Vienna. They moved to Chicago after Hans escaped from Vienna during World War II. He met and married Brenda, a violinist, in London. The family lived in Chicago's Burnside neighborhood at 87th and Kimbark from 1953 to 1966, working as musicians, and even hosting small, intimate chamber concerts themselves. While in Oak Park, Felix's father Hans played keyboard, piano and organ in many venues, including Grace Lutheran Church, and several local temples. He also recorded on WFMT and performed in musicals, such as Bye, Bye Birdie. As a salesman for Allen organs, Hans acquired the first Moog synthesizer in Chicago, his daughter says. In 1969, RCA released The Moog strikes Bach an album of Wurman performing pieces by Mozart, Chopin, Rachmaninoff and Paganini on the synthesizer. Felix's mother, Brenda, was an early pioneer of the Suzuki violin teaching methods who taught more than 100 students in Oak Park and Chicago six days a week. When she died suddenly in 1988, "more than 600 people came to her memorial service," says Yoshikai. According to an obituary, Brenda also donated lessons and musical instruments to inner-city children. The Wurman siblings all chose musical careers. Felix's brother Alex is a Hollywood soundtrack composer whose credits include music for March of the Penguins and Temple Grandin. Sister Nina produces and composes music for a theater in Heidelberg, Germany. Candida Wurman Yoshikai teaches violin. rolled around, he chose to attend the "XP: Experimental Program" an alternative high school offered by Oak Park and River Forest High School. XP was a so-called "Free School," based on the "Summerhill" educational principles of A.S. Neill. In a science class, Felix was exposed to Buckminster Fuller's geodesic dome as a form of inexpensive housing. "He developed a dome fixation — he built one in our backyard," says Yoshikai. The dome concept would later bring him fame in Europe and even help win him the British equivalent of a Grammy. After graduating from OPRF, Felix was offered a scholarship to Julliard School of Music, which he declined, choosing instead to go to England and study for two years with British cellist Jacqueline DuPres. 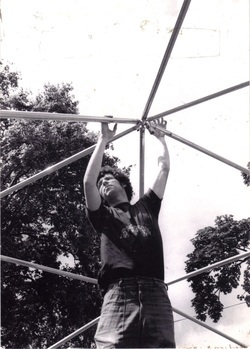 Beginning in 1977 and into the 1980s, Felix was playing chamber music in Britain when friends joked that they could bring their music to more people by building a "portable concert hall." Felix constructed a geodesic dome tent that accommodated 200 concertgoers. His quartet — renamed "Domus" — performed at music festivals throughout Europe and won a Gramophone Award (the British "Grammy") in 1980 for best Chamber Music Recording. In his 2009 obituary, the quartet's pianist remembered, "Felix was probably the only person in the world who could have got me to run about in the rain carrying heavy boxes full of aluminum tubes. When things got tough, as they soon did, he rallied us all with his heartfelt cry of, 'It must never not be fun!'" Domus experimented with videotaping performances and even providing food for audience members. According to his sister, Felix also developed a wheeled conveyance for his cello that hitched to a bicycle. He eventually returned to Chicago, where he got a cello gig at Lyric Opera. But when a friend invited him to Albuquerque, he moved west. He resurrected the dome briefly in Albuquerque, and then started the Church of Beethoven. The concept quickly gained national recognition from the L.A. Times and NPR. The "church" moved to the Kosmos, a converted warehouse arts-space with chandeliers. Inspired by Fuller's "doing more with less" concept, Felix, always a connoisseur of coffee, offered free cappuccino and even complementary massages before the concert. "I honestly believe we're working on a spiritual level. We're working on a healing level," Wurman told an interviewer in 2009. First of all, the Church of Beethoven is not a church, though its format resembles the common practice of setting aside an hour or so at a scheduled time to share a spiritual experience with like-minded people. The idea originated with the late Oak Park native and classical cellist Felix Wurman, who established the unusual concert series in Albuquerque, New Mexico, far from his Chicago-area roots. “Felix was all about building a spiritual community, the way a church does, but in a non-denominational way,” said his sister Candida, who lives in Durham, North Carolina and will come in for the inaugural program Sunday, July 17. The morning includes a performance of Bach’s Cello Suite by Katelin von Walterskirchen, a graduate of New Trier High School, who studied with Marc Johnson of the Vermeer Quartet and has done further study in Germany, and Bach’s Sonata in G Minor/Partitas by violinist Scott Daniel, a junior at Oak Park River Forest High School, who is also a member of the Chicago Youth Symphony Orchestra. As in Wurman’s original Church of Beethoven programs, there will be a spoken word portion of about 15 minutes, provided by Tim and Pamela Leeming of Oak Park, as well as their friends Sheila Haennecke and Leisa Marthaler Hoover. “Jean Lotus asked us to arrange that part of the program, because she knew of our interest in poetry,” said Tim Leeming. Lotus, who has lived in Oak Park for 10 years, is a member of the board of Handel Week, which is presented each winter in the village. “When I first came upon the Church of Beethoven in Albuquerque on Facebook, I thought it would do really well in Oak Park,” she said with obvious enthusiasm. “It would be on an intimate scale and just last one hour on Sunday morning. A lot of people have Sunday morning free. Wurman grew up in a musical household and his parents established a chamber music program in Oak Park in the 1950s. His talent surfaced early and the lad soloed with the Chicago Symphony Orchestra at age 12. Instead of accepting an invitation to attend the Juilliard School, he went to Europe and studied with the renowned cellist Jacqueline du Pré, who was by then no longer able to concertize due to multiple sclerosis. He returned home and played from 1980 to 1984 in the orchestra of the Lyric Opera of Chicago, but he also went back and forth to Europe. He finally settled in the Southwest and joined the New Mexico Symphony Orchestra. With some of his musical colleagues, he formed the Noisy Neighbors Chamber Orchestra. Wurman’s sister Candida confirmed the picture of her brother as a musician who was all about breaking down walls. For his Noisy Neighbors he created a 200-seat portable concert hall, called Domus — a geodesic dome, which he would put up and take down himself. “It became a familiar sight wherever he would perform,” she observed. The idea for the Church of Beethoven arose after Wurman played at a church service and was struck by the spirituality of the music experience, quite apart from the religious aspects of liturgy. Again, he tapped his orchestral colleagues and they began playing chamber music concerts on Sunday morning in an abandoned gas station off old Route 66. They called it The Filling Station, and its purpose was to give music lovers the same experience of community and spiritual uplift that they might get from church membership and regular Sunday worship. The event in Oak Park begins at 10:30 a.m., but the audience is urged to arrive around 10 to enjoy some coffee — at this point regular, not cappuccino. After the concert Trattoria 225 is offering audience members a special price for brunch. Two more Sunday programs are planned for Aug. 14 and Sept. 18. And don’t worry too much about that “church” designation. The concert is definitely open to persons with regular denominational affiliations.